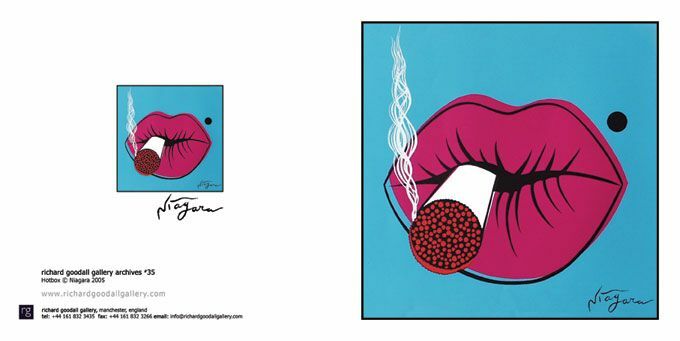 Set of 4 - Hotbox Greeting Cards by Niagara. Limited edition of only 500 of each card produced. You get 4 of the same card. Choose shipping quote if ordering just cards as they ship very cheaply and we will let you know after they are ordered. Each card is 16 cm square with a 14 cm square image on the front and has a printed signature of the artist on the back with a smaller version of the front image and the number in the range. Each card is individually wrapped in a sealed cellophane wrapper with an envelope. All cards are blank inside for your own messages. Once each card is sold out it will not be reprinted.